Lakers defender Casey Berger gets air in pursuit of a ball; G-NG's Jacob MacCallum barrels toward the same target. NEW GLOUCESTER—Patriot Julius Rapp broke a lengthy stalemate with the Lakers late in the first half on Saturday afternoon, Sept. 16, kicking off a battery of G-NG goals by a battery of G-NG players. Despite some solid Lake Region defense, the Patriots rolled past their visitors to a satisfying, 4-0 win. It took the Patriots a good chunk of time – the majority of the first half – to figure out the Lakers’ defense. Though G-NG controlled the attack for much of that stretch, they couldn’t generate the quantity or quality of shots they needed to really light up the scoreboard, and Lake Region keeper CJ Ferguson deftly repelled the shots they did manage. For their part, though, the Lakers also had trouble – more trouble, really – churning up much in the way of offense. Their first quality look never came until around the 30th minute, and even that shot, a roller along the ground from outside, proved an easy enough stop to make for G-NG netminder Brannon Gilbert. John Henry Villanueva, the Patriots’ standout keeper in recent years, graduated in June. With 5:22 to play before the break, Rapp snapped the teams’ deadlock, blasting the 1-0 point past Ferguson from the high-right. 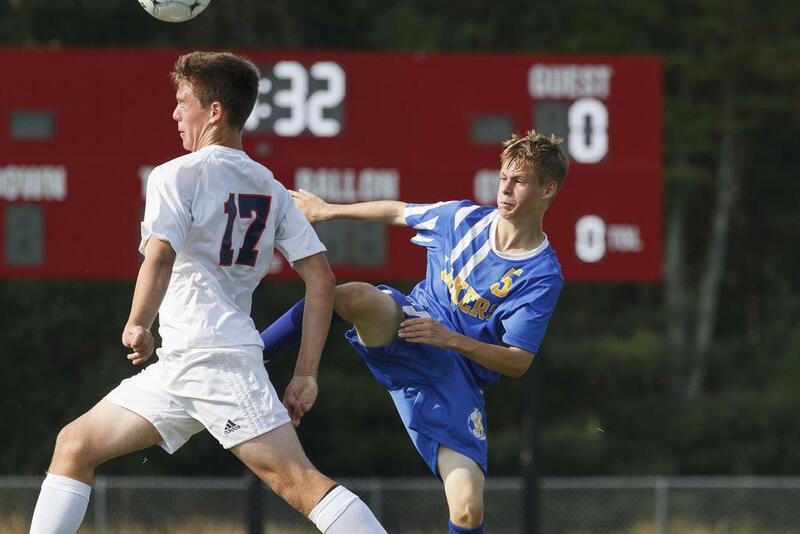 After Rapp got the (proverbial) ball rolling, G-NG’s attack turned far more productive: The Patriots added their second of the afternoon – a Matt Gurney strike – barely more than three minutes later, for example. They also tallied two in the downhill half: Nick Pelletier scored in the sixth minute, slinking through the middle and toeing the ball high past Ferguson, and Austin LaLiberty scored with approximately nine minutes remaining, wending around multiple defenders and snipering the top-right corner of Ferguson’s net to do so. Higgins elaborated. “We did a great job of winning the ball in that first half, and then when we won it, we got numbers forward,” he said, “but the numbers were all just running direct, rather than trying to check into space and open up space for someone else to go behind. Because of that, we were getting caught offside – just by playing through balls, playing a straight ball to a straight run instead of looking to play something diagonal through, or move their defenders with our movement and create space for someone else. G-NG moved to 2-2 with the win. The Patriots have dropped matchups with Yarmouth and Greely, while picking up a victory over Wells. They faced off at Fryeburg on Tuesday the 19th, winning 3-1, and will host York on Saturday the 23rd. Lake Region slipped to 1-4. The Lakers emerged triumphant vs. Poland, but fell to Wells, Freeport and St. Dom; they hosted York on Tuesday, succumbing 10-0, and will travel to Greely on Friday and Fryeburg on Saturday. Lakers defender Casey Berger gets air in pursuit of a ball; G-NG’s Jacob MacCallum barrels toward the same target. Laker Giovani Lopez and Patriot Austin LaLiberty go shoulder-to-shoulder. G-NG’s Tristan Fogg heads a ball vs. the visiting Lakers on Saturday. Laker Thomas Kolofsky and Patriot Noah Bruns race toward a runaway ball. Peter Vigna of Lake Region jets away from G-NG’s Jeremiah Gendreau. Patrtiot Nick Pelletier and Laker Tristan Chaine battle. G-NG’s Nick McCann does what he can to fend off LRHS’s Nate Bragdon-Clements.